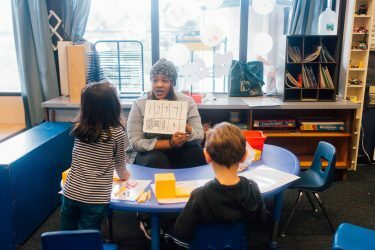 Haring Center researcher Dr. Katie Lewis is challenging traditional views about how all children learn mathematics in schools. Young children can benefit from routine opportunities to hear and practice counting. Young children should have the opportunity to watch and participate in counting objects, in the world or in children’s books. Kids need repeated practice counting before they understand that the last number counted tells you how many objects there are (count 1, 2, 3, 4, 5, so there are 5 toys). As children begin to understand that number words describe the amount, it is helpful to start counting beyond 20 so that kids can begin to hear the regularities in the counting sequence. Parents and kids can have fun challenging themselves by skip counting (counting by 2s or 10s). Counting helps unlock their ability to describe their world quantitatively. Numbers are represented by people in a variety of different ways. For example, the number two can be represented aurally as the word “two,” or written in words (two), symbols (2) or drawings (··). For adults, translating between these different forms is second nature, we are not even conscious that we are doing it. Dr. Lewis recommends using tangible objects to help children concretely represent quantity. “Kids need a lot of experience comparing, combining and separating quantities. You can tell a child that 2+3=5 and 3+2=5 but that is not going to mean anything beyond memorizing.” Having kids explore with actual objects, like jellybeans, enables them to discover relationships between numbers. If the child has 5 jellybeans and you hide some under a cup they can figure out how many are under the cup based on how many they can still see. This gives kids practice with decomposing numbers, where they can check their own answer (by counting the number under the cup). Dr. Lewis recommends meal times and other social activities involving sharing as an opportunity to embed math and lay groundwork. Finally, Dr. Lewis encourages children and teachers to see math as an exploration. Mathematics is everywhere, you just have to look. Kids are expert observers. When outside with children, try to find as many triangles and other shapes as possible.